Gerald A. “Pete” Woodard, 89, Frazee, MN, died Tuesday, March 27, 2018 at Oak Crossing in Detroit Lakes. Funeral services will be 11:00 AM, Tuesday, April 3 at David-Donehower Funeral Home in Detroit Lakes. Interment will be in Sacred Heart Cemetery with Military Rites conducted by the Lake Region Veterans Honor Guard. Friends may call from 5:00 – 7:00 PM Monday, April 2, with a prayer service at 7:00 PM at David-Donehower Funeral Home in Detroit Lakes. Gerald Woodard, known as “Pete”, was born August 27, 1928 in Frazee, MN to Milton and Jessie Marie (Stacey) Woodard. He was raised and educated in Frazee and is a 1946 graduate of Frazee High School. While in high school, he was a three-sport athlete, lettering in football, basketball and track. Following graduation, Pete enlisted in the U. S. Navy, serving 29 months on the U.S.S. Sabine. Following his discharge, he returned to Frazee where he worked with his dad at Woodard's Bait. Pete was united in marriage to Mary Mahoney, June 22, 1950. They made their home in Frazee where Pete was employed with Snappy, Inc. in Detroit Lakes from 1956 to 1990. For many years, he was the plant manager on Legion Road. He was well known for his interest in amateur baseball and played for the team in Frazee and with the Perham Pirates. After his baseball days, he played fast pitch softball with the Ketter’s Meats Team. 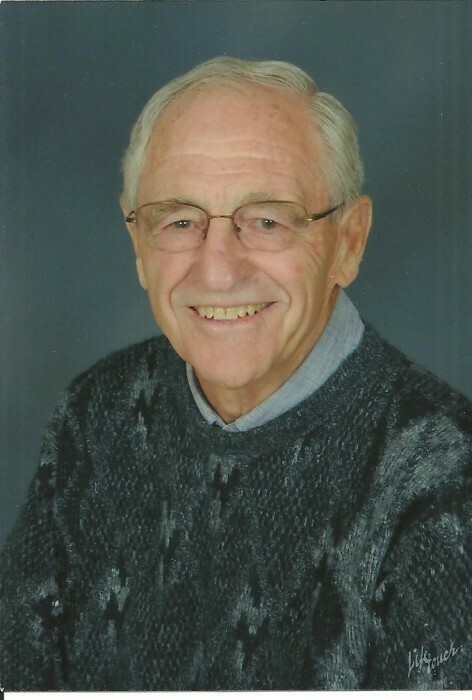 He was an avid golfer and served for a number of years on the Frazee Golf Course Board of Directors and spent many hours volunteering at the course. He was a three-time winner of the Frazee Father’s Day Golf Tournament. He was an avid follower of all Frazee High School sports and in 2003-2004, was named the Frazee wrestling fan of the year. Pete loved the outdoors, especially time spent in the woods at Itasca Park. He looked forward to all hunting, especially deer hunting. He enjoyed his time spent fishing with his brothers. He also took great pride in caring for his lawn. Above all, Pete was proud of his family and all of their accomplishments. Survivors include his wife of 68 years, Mary, of Frazee, daughters: Diane Schumacher of Frazee and Gail (Maurice) Peterson of Cold Spring, MN, Sons: Pat (Anne) of Parker, CO., David (Tami) of Moorhead, MN. 11 grandchildren; Colleen (John) Hoscheid, Stacey (Aaron) Henstorf, Jessica (Josh) Miosek, Ben (Danielle) Peterson, Matt (Elysia) Peterson, Kevin Woodard, Erin Woodard, Cassie Woodard, Andrew Woodard, Cory Woodard, Lexi Woodard, 13 great grandchildren and one great-great grandson; a brother, Neil of Frazee. He was preceded in death by his parents, a brother Robert, sisters-in-law, Becky and Janice Woodard. Furey Funeral Home is serving the family.